The 42-ppm MP C401 and MP C401SR offer color copy/print/scan and optional fax services in a compact floor-standing model design, along with a full range of advanced features and capabilities optimized for users without 11" x 17" output needs. Convenient features include a 50-sheet automatic reversing document feeder, Scan-to-USB/E-mail/ Folder, PDF Direct Printing, ID Card Copy and many other enhancements from previous models. 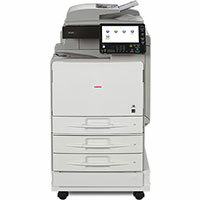 Support for Mobile Printing is standard through Ricoh’s Smart Device Print application. An optional 10.1" tablet-like Smart Operation Panel is available for users who prefer a screen with pinch, tap, and flick capability. Add the optional Browser Unit to connect to cloud-based applications. Standard color copying, scanning and printing services. Super G3 faxing is optional. 1GHz Intel Celeron CPU with 2GB RAM supports Ricoh’s latest Services-led controller technology. Standard USB 2.0 and Gigabit Ethernet interfaces for direct and hardwired network printing and scanning. Efficient 42-ppm black & white and color printing at up to 1200 x 1200 dpi resolution. Standard with PCL6 and genuine Adobe Postcript 3 print drivers included. Tilting 9" color control panel with customizable home screen and integrated USB and SD card slots supports walk-up printing environments. An optional 10.1" WSVGA Smart Operation Panel is available for users who prefer a tablet-like screen with pinch, tap, and flick capabilities. 320GB HDD supports secure local document storage and print-on-demand, storing up to 9,000 pages. 8.5" x 11" platen glass for scanning, faxing, and copying. plus a 50-sheet Automatic Reversing Document Feeder to process multi-page originals in sizes up to 8.5" x 14". MP C401SR model offers standard 250-sheet internal finishing and single position stapling of up to 50 sheets without any increase in footprint size. Compatible with all current Windows operating systems including Windows XP, Vista, 7, 8, Server 2003/R2, Server 2008/R2, Server 2012. Easy to change, front loading toner cartridge replacement. 650-sheet standard paper capacity with maximum of 2,300 sheets available through addition of optional paper feed units. Embedded OCR option supports creation of searchable PDF files and removes blank pages from scanned documents. Enhanced security features, including mandatory security information printing and HDD erasure. Optional IEEE 802.11 a/g/n Wireless LAN for cable-free connection and flexible placement. Improved power specifications and environmentally-friendly features to help reduce energy consumption and better control printing costs.